Wrothgar is a region situated in northeastern High Rock, north of Stormhaven. 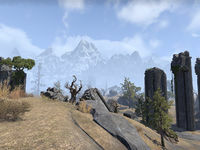 It was the first new neutral PvE zone with content for solo players and small groups to be released for Elder Scrolls Online. Orsinium, the ancestral capital of the Orsimer, is located in the eastern mountainous area within this region. King Kurog has declared Wrothgar as a "truce zone"; all adventurers are welcome, but agents of the Alliance War will not be tolerated here. There is animosity in the region between the followers of King Kurog, who are devoted to the ideals of Trinimac, and the chiefs of the Orcish clans, who follow the Code of Malacath. 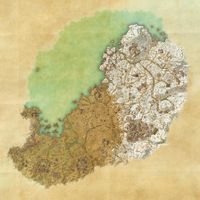 It is a DLC zone added by the Orsinium DLC. Denotes a quest which is part of the main chain and required for Orc King's Councilor. Denotes a quest which is part of the main chain and required for Orc King's Marshal. Denotes a quest which is part of the main chain and required for Orc King's Conqueror. Denotes a quest which is part of the main chain and required for Kingmaker. Blood Price: Find out if Chief Ogzor was actually murdered. Broken Promises: Find out what happened to High-King Emeric's messenger. A Cold Wind From the Mountain: Recover the skull of a legendary bear. Cultural Affections: Help Rigurt obtain the affections of his Wrothgarian counterpart. Draugr Dilemma: An inept adventurer has awoken the draugr of a mysterious barrow in Wrothgar. The Durzog Whistle: Investigate a durzog training whistle and find an interested buyer. A Feast to Remember: Help Orzorga prepare a main course for the King's feast. Flames of Forge and Fallen: Fulfill the duty of a dying priest of Malacath. Forcing the Faith: Aid the artisans who have been captured by the Vosh Rakh. A Healthy Choice: Help Orzorga prepare an appetizer for the King's feast. A Heart of Brass: Find survivors of an ill-fated expedition to a Dwarven ruin. Hidden History: Discover what has altered the Orcs in Rkindaleft. A Khajiit's Tale: Help an unusual orc find out about his family. Kindred Spirits: Help Orzorga prepare a drink for the King's feast. Of Sentimental Value: Find a shipwreck survivor's lost pendant. One Ugly Mug: Find a thief's stash and decide what to do with it. Riekr Revenge: Rescue some young hunters captured by Riekrs. Silver Linings: Recover the banner of the Silver Dawn. Thicker Than Water: Help Orzorga prepare a dessert for the King's feast. Thukhozod the Eternal: Help a pair of adventurers find a missing Orc. Tinker Trouble: Track down a rampaging robot in the wilds of Wrothgar. A Treasure in Need of a Home: Find a researcher interested in some Nord antiquities you have found. An Unexpected Fall: Kireth Vanos may be in trouble in a Dwarven ruin. Again. Where Loyalty Lies: The Daggerfall Ambassador's fleet has been blown off course and shipwrecked on the ice. Wrecked: Help some traveling merchants who have been attacked by Winterborn. For more information on these quests, see this page. Breakfast of the Bizarre: Collect strange eggs in Coldperch Cavern for a client. Fire in the Hold: Deal with the bandits in Watcher's Hold. Free Spirits: Set free the spirits trapped by the evil sorcerer Gorlar the Dark. Getting a Bellyful: Obtain special durzog feed from Nikolvara's Kennel for an interested client. Heresy of Ignorance: Stop the Worm Cult from summoning a terrible champion. Nature's Bounty: Cleanse the corruption that is blighting the Wrothgar wilderness. Parts of the Whole: Collect data on the constructs of Zthenganaz. Meat for the Masses: Get supplies for the workers rebuilding Orsinium. Reeking of Foul Play: Deal with the Riekrs who are raiding caravans. Snow and Steam: Deal with some dangerous Dwarven machines. The Skin Trade: Collect werewolf pelts for a client in Argent Mine. This page was last modified on 12 June 2018, at 05:05.